I recently traveled to Copenhagen during the Autumn school holidays and visited a fellow outbound Rotary Youth Exchange student also sponsored by my Rotary District 9710 in Australia. We met each other at both Outbound orientations in Australia and she has been living in Copenhagen as an exchange student since January. I took the opportunity to visit her for a few days and to see the city of Copenhagen. The train journey from Flensburg to Copenhagen took a mere 4 hours. I departed Flensburg at around 7am and arrived in at the central station at around 11am. Lucy met me there in front of Starbucks and introduced me to two of her exchange friends, Anna (Australia) and Tess (USA), who we would be spending the day with. The weather wasn’t off to a great start as it was steadily raining as we exited the train station. Lucy directed us to the Danish National Museum, where we sheltered from the rain. We entered an exhibition entitled “Stories of Denmark” which documented the history of Denmark throughout the 20th century. After the rain had stopped we made our way back outside and walked to Nyhavn, a popular tourist spot where bright colourful houses line a small canal. On the way, was a temporary sculpture called “The Happy Wall”, the wall was painted black all over but covered with hundreds of little doors which open to reveal different coloured paint underneath. By opening doors and closing others, one can make patterns or spell words on the wall. Nyhavn was a very picturesque location despite the grey weather, I can only imagine what a beautiful place it would be during the summer time. Brightly coloured houses dating back to the 17th century line either side of the canal along with many small bars, cafes and restaurants. Many historical wooden ships lie on the water. By this time, it had started to rain once again so we sought refuge inside a cosy cafe and drank hot chocolate together. Unfortunately, it was then time to say goodbye to Anna and Tess who started heading home. 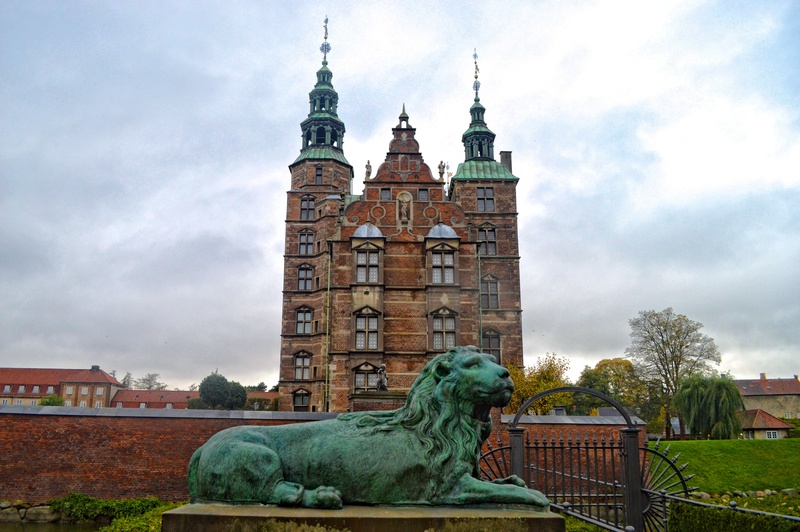 Lucy and I decided to continue sightseeing and walked in the direction of Copenhagen’s harbour and Royal Palaces. Darkness was falling as we reached the Amalienborg Palace complex where the Australian princess Mary, and all other members of the Danish royal family reside. Four palaces surround an octagonal courtyard where the family lives during the winter months. Directly across from the palaces is the harbour and national Opera house. 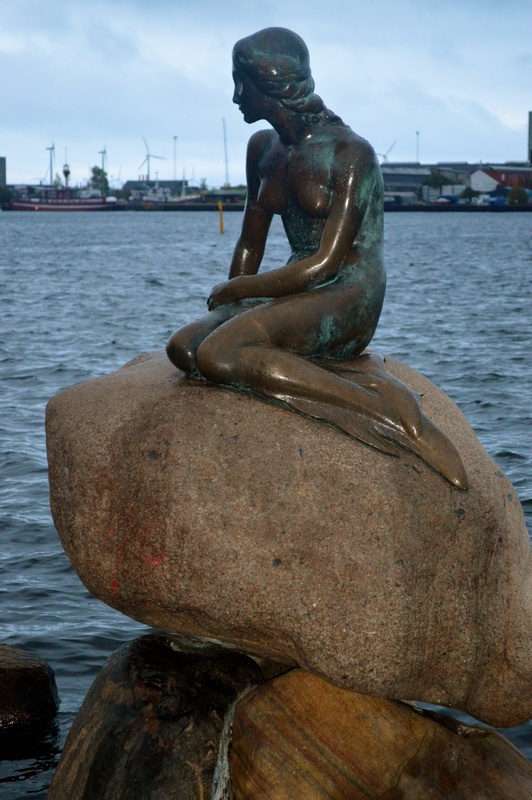 The world renowned little mermaid statue is also located on the waters edge and can sometimes be very crowded, but luckily not when we visited. The figure is actually rather small in real life, but is nevertheless a sweet tribute to Hans Christen Anderson’s fairy tale and something to tick off the bucket list. We then joined Lucy’s host family for dinner in their home around 30 minutes outside of Copenhagen, but not before travelling once again into the city to pick up my luggage which I accidentally left behind in a storage locker at the central train station. My second day in Copenhagen was once again a full day of sightseeing and touring the city. We first paid visit to Christiania, a commune which distinctly separates itself from the rest of Copenhagen, Denmark and the EU. The community is built around a small lake and has ongoing problems with the government as residents are living on government owned land, yet calling themselves separate. Lucy and I then climbed to the top of the Church of our Saviour which has a corkscrew spire with an external winding staircase. 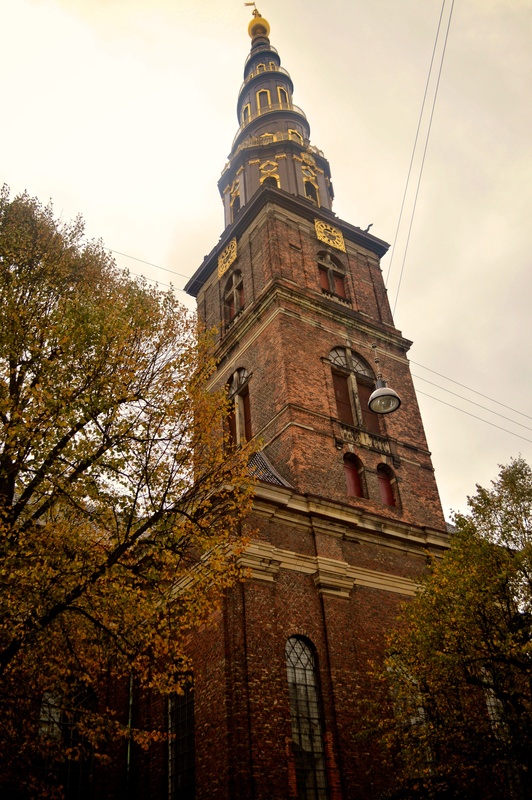 We our way up an extremely narrow staircase and climbed way too many stairs before finally reaching the summit with an incredible 360 degree view of Copenhagen, definitely making the climb worth it. After eating lunch we walked to Rosenborg Castle where the royal Danish crown jewels are held. The rooms of the castle are open to the public and have some beautiful antiques inside. Tivoli Gardens is a theme park in Copenhagen which is opened during the summer months and for 2 weeks during Halloween and Christmas. We spent the evening there as it was a beautiful atmosphere to see everything lit up so brightly. The whole park is heavily decorated and filled with rides, live shows and shops. We just looked around together and took photos as we had decided that it would be too expensive to go on any rides. On Sunday, it was pouring rain the whole day so we slept in, stayed inside and watched movies while enjoying each others company. It was lovely to have such a lazy day and continue to catch up until I caught my train back to Germany in the evening. Thank you to Lucy and her host family for hosting me during my visit to Copenhagen! Lucy, you were a fantastic guide and I had so much fun with you in your beautiful city! Can’t wait to see you back in Australia!